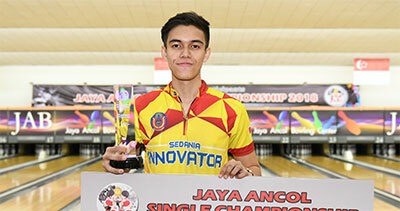 4th May, Jakarta: Muhammad Azizi Naim of Selangor SUKMA squad claimed his first international title after an easy victory in the Youth Masters finals of the Jaya Ancol Singles Bowling Championships 2018 on Friday. Muhammad Azizi got off the block with a cracking 257 in his opening game to lead 2016 Asian School Doubles gold medallist, Alex Yu of Hong Kong by 38 pins with Malaysia's Muhammad Razydan and Farissa Najihah following in third and fourth. Azizi stumbled to a lowly 170 in his second game allowing Farissa to take over the lead. Azizi and Yu shared second spot, just six pins adrift. But the 20-year-old SMK Section 9, Shah Alam bounced back brilliantly with 258 to regain the lead. Yu stayed in second, 70 pins behind while Farissa slipped away after a poor 159 in her third game. Azizi added 192, 215 and 214 in his next three games to remain in the lead. Malaysia's Najihah, the recovering Farrisa and Yu tussled for second spot. The leader eased off with 170 and 184 to claim victory with 1700. Farissa ended strongly with 223 to take second spot with 1655 while Yu stormed with 241 after a disasterous 133 in the ninth game to clinch third position with 1653. Najihah finished fourth with 1620. Jana Tan Qiu Xuan of Agape Bowling Academy, Singapore, who was second before the final game, sufferd a poor 145 to settle for fifth position with 1608. 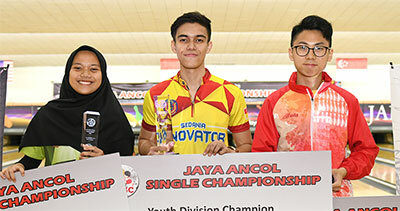 Muhammad Azizi, who won three gold (Singles, Doubles and All-Events) medals at last year's Malaysian National Interstate Championships representing Selangor in the Youth division, pocketed the top prize of 16 million Indonesian rupiah (approx. US$1,200) as champion. Farissa and Yu earned 10 million and 6 million rupiah for finishing first and second runners-up. Ms Iyenwati, Deputy Organizing Chairman was on hand to present the trophies and prizes to the top three winners. The Classified Masters finals will be held later today at 4.00pm local time while the Mixed Open division Masters finals will take place on May 5. The inaugural Jaya Ancol Singles Bowling Championships 2018 is organized by the Indonesian national elite squad members, Ryan Lalisang, Tannya Roumimper and Hengki Susanto and supported by Jaya Ancol Bowling Center and Persatuan Boling Indonesia. It is sanctioned by Asian Bowling Federation and World Bowling attracting bowlers from Australia, Brunei, China, Hong Kong, Malaysia, Philippines, Saudi Arabia, Singapore, Thailand and UAE. Photos by Terence Yaw in Jakarta.